Donald Trumo, Rihanna, Kylie Jenner and Kanye West were all named to the list. 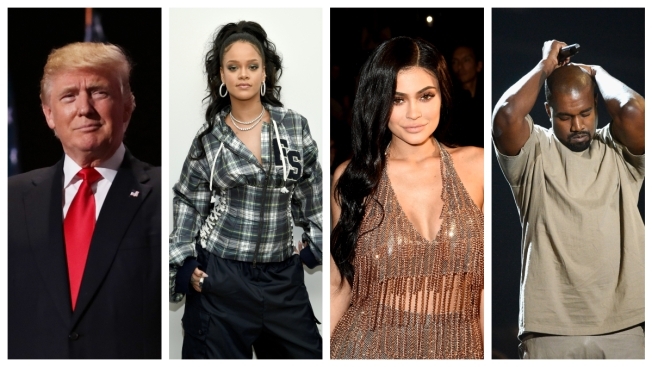 Kylie Jenner, Kanye West, Rihanna, Busy Philipps and Matt Drudge have landed on Time magazine's roundup of the most influential people on the internet. So did someone with 53 million Twitter followers — President Donald J. Trump. When it comes to Trump, Time says his "unorthodox stream of consciousness" generates headlines and galvanizes his base. The magazine credits the president with turning his Twitter account into "the ultimate presidential bully pulpit."